I remember watching Shakespeare’s Hamlet with glowed eyes in those years when I was still a kid. It didn’t seem like British, but rather the story of jealously, revenge and killing a brother to become the king, was in every way – Chinese – just think of any of the past emperors and you will understand. So in many ways, it is almost inevitable that a Chinese film maker will eventually remake Hamlet into a Chinese tragedy film. 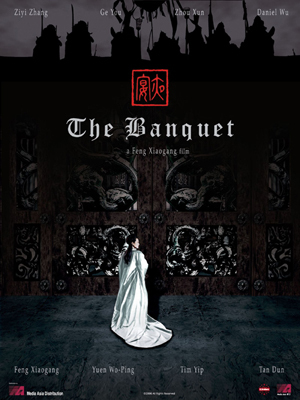 With that being said, The Banquet is directed by acclaimed Chinese director Feng Xiaogang who has hardly put a foot wrong in low budgets dark comedies like Cell Phone and World Without Thieves, but somehow this movie processes something different, a lavish production set and dreamy-like special effects. It is by no means a failure, and there are moments that are worthy of re-watching, especially the roof top scenes and almost every scenes with Zhou Xun. Nonetheless, the beauty of the set, over shadowed Feng’s usual straight forward directing style and the effect is like hiding a message behind a huge rock. As much as Neo loved the dream of riding through the beauty of the Banquet, he must surely admit that this is far closer to The Promise than Zhang Yimou’s Hero. There isn’t really any point in discussing the plot and thematic events as almost every readers who have been through high school, probably knows the story of Hamlet far better than I do. Surely it isn’t the plot that drives me through the journey, but rather the dream like sequence of the fight scenes and the beauty of the spectacle that made The Banquet far better than it should be. Neo is fast becoming a big fan of Zhou Xun, after her wholly natural performance in Perhaps Love; she grows into this role and shines through despite her being criminally underused. Perhaps, Zhou resembles a girl from Neo’s past and to be perfectly honest, that is probably the reason why he pin points her performance as shining brightly above Zhang Zi Yi, despite the later being in the leading role. Bias or not, you can be the judge, but Zhou combines innocence with perfect juxtaposition about love and representing the beauty of human nature. 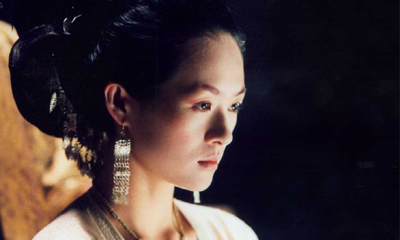 Despite, Zhang Zi Yi’s unanimous stunning sexual display in 2046, where Neo absolutely loved her handling of an immensely difficult role; she is in every way the weak link of the quadrant. Yes, she is elegantly beautiful, but in many ways she is yet to prove that she can carry a film on her own. In 2046, she have the outstanding Tony Leung Chiu Wai as a co-leading star and in House of Flying Daggers, she have the ever hardworking Andy Lau, unfortunately in Banquet, she have only supporting actors in Daniel Wu and Ge You. All the more disappointingly, she is outshined by the underrated Zhou Xun, whose is in every manner more natural and convincing than her counterpart. Sometimes, one may wonder, whether Daniel Wu is really the answer to HK cinema’s new generation. After scene stealing performances in New Police Story, Everlasting Regret and Beyond Our Ken, Wu have risen above his current contemporizes. Here is he suitably unconvincing in a role more suited to younger suitor, but nonetheless, as with usual, Wu gives it his very best and in many ways, he resembles a younger Andy Lau, whose limited acting ability is more than compensated by the effort he puts in each role. 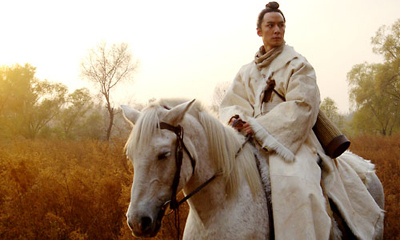 Perhaps, one reason why Wu isn’t as convincing can be due to being overshadowed by the almost unrecognizable Ge You, who have almost become – Zhang Yimou’s Hero – emperor’s clone. His movements and gesture gives life to the movie and provides some much needed relieve of tensions in a movie that have more looks than inner substance. Scenes like the rooftop action sequences in the artistic temple, is menacing to watch as the water drops slowly in almost a slow-mo fashion. Director Feng has a great eye and even in moments of tense and unforgiving situations, there is a sense of black comedy and sarcasms within the layers behind the colorful sets. Some may even suggests that Feng may well be commenting on the Chinese government, but seriously, even if he really did, Neo would hardly care. Starring: ZHANG Ziyi, GE You, Daniel WU, ZHOU Xun, HUANG Xiaoming, MA Jingwu.